I live in Elwood, Victoria, Australia. It is a bayside suburb of Melbourne. Elwood has a nice village atmosphere. I have lived in the area for over 20 years. My interests are birding ( & the associated travel), photography, drawing and art, classical guitar, renovating a 100 year old Edwardian house and creating a useful and edible garden. 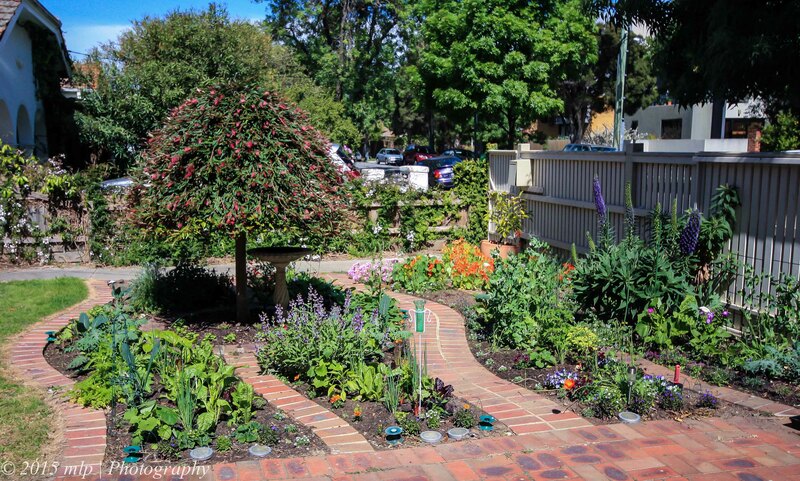 Front Veggie Garden – An Aussie Potager. I ripped up the front lawn and made 4 rows of mixed veggies, herbs, edibles and flowers. The weeping Grevillea in the centre is a great attracter for Bees and Honeyeaters. 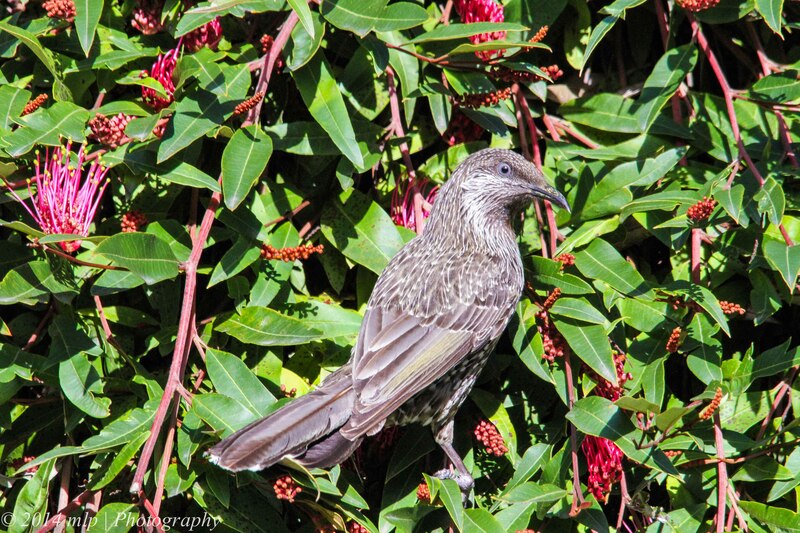 Little Wattlebird on the weeping Grevillea. OMG has anyone told you your photos are amazing!? I actually stumbled upon your blog while looking for a specific kind of possum (ring tail, super cute) that ran into the house of a friend of mine. And I found this super duper cute photo of a possum seemingly sleepy curling up in a tree in your blog. And then I was completely fascinated by all those photos you’ve taken, and yes also by the very wide range of species of different animals and plants and also the urban scenery you’ve covered here. I mean wow! How and where did you learn that many names of different animals & plants!?! I had just moved to Melbourne about a year ago and I love all those wildlife and this beautiful nature Australia has every time I go take a walk around somewhere. And everytime I saw some beautiful birds cute little hares foxes I would totally be bummed that I don’t know their name/couldn’t really capture the beauty of them with just my phone. And your blog is like OMG! Just as beautiful as a I experienced them here. Your photos somehow kinda just brought me back to those moments and relive all those amazing memories. Like you know just looking at those photo and I’d get stunned and reminded of some places I’ve seen around the country. Hey Sadie, thanks for the kind comments. A few years ago I just started with a basic camera and a book on birds and just studied from there. I photographed birds just so I could try and identify them later and the hobby just grew. I have a group of friends (who I met locally while walking) who specialise in different things and have taught me heaps (photography, botany and biology and birds). And of course there is the internet and other peoples blogs. I just like to keep learning. My favourite local spot is Elwood Canal and Elster Creek and wetlands and I often walk along them exploring. Its where I started my birding journey…now most weekends I head out to different parts of Melbourne (and Vict) looking for new things…like anything you start off with a simple setup and basic knowledge and you just build over time. Get out there and have fun! Do you think you would post sth about them here in the future?? They sound lovely lol. There were I think a few brush tails(maybe a family) living in the roof of the house I previously lived in. They like to sit on the electric poles outside the house at night with their tails hanging down. First time I saw them I thought it might have been a big cat/raccoon! And they always came down to the front yard if I leave them some banana/apple there lol. They look so cute while eating (probably not so if eating from my plants lol). Do those ring tails eat your veggie or any fruits you’ve planted? And what does the drey you made for them look like?? What kind of drey do they like to live in? ?